Humor is a multifaceted tool in the writer’s arsenal. It first offers a point of connection, allowing readers a glimpse behind the curtain, where they find not a polished, published author, but a human being like themselves. In more difficult topics, such as grief, depression or illness, humor can be the hint of levity, the spoonful of sugar transforming the nearly unbearable to tolerable. Yet many writers find themselves intimidated by humor, feeling they just aren’t funny enough to incorporate it effectively, or that their lives lack the off-the-wall occurrences necessary for good material. 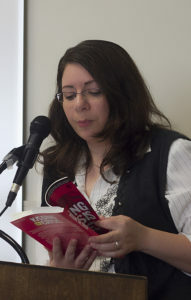 During the September Pensters meeting, Author Kara Bachman addressed these common fears, assuring attendees that being a stand-up comedian was not a requirement for writing humor. “It’s not about the event, it’s about how you interpret it,” stated Bachman. Stories with the biggest impact are those readers where readers can relate, so finding a humorous take on even a mundane, every day scenario can be very effective. Creative misdirection is one way to accomplish this. Make the reader think you are taking them one place, then lead them somewhere they didn’t expect. Writing humor isn’t a constant string of one liners either. Sometimes, less is more. In her book, “Kissing the Crisis,” Bachman deals with subjects such as her mother’s death from cancer, and the period where her home was flooded by Hurricane Katrina. Neither of these scenarios scream comedy, but a touch of humor in the right places makes it more comfortable to discuss traumatic events, for both the writer and the reader. “There is a fine line between grief and humor,” reminds Bachman.